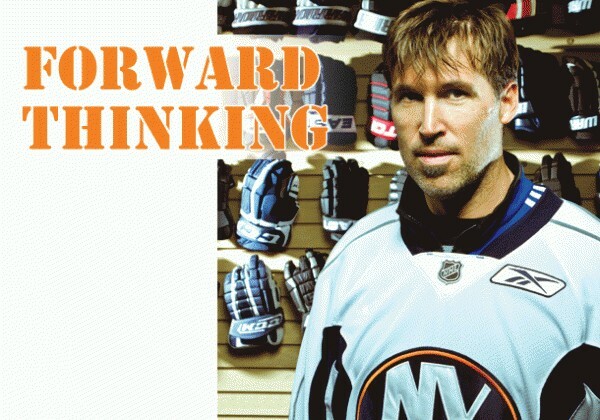 Glance at Brian Rolston’s face and it’s nothing like the other forwards on the New York Islanders roster—the gray hair in his beard, the scar over his left cheek. He’s fought for possession along the boards for years. He’s had to earn his 11 trips to the playoffs, three times worn the letters “U-S-A” across his chest and at one time clutched the Stanley Cup above his head. At 38 years old and with 17 seasons under his belt, Rolston knows what it takes for a team to earn its stripes. Skilled forwards, physical defensemen, solid goaltending, they’re all important, but there’s an element of toughness—which he’s exhibited—that is in every winning combination. By Thanksgiving last season, the Islanders were finished. They weren’t mathematically eliminated from playoff contention, but after dropping 14 games in a row, nobody was mistaking them for contenders. However, they showed some life in the 2010-11 season’s latter half under Head Coach Jack Capuano, compiling the second-most points in the East after December 16, trailing only Cup champion Boston. Michael Grabner and Matt Moulson topped the 30-goal plateau and wunderkind John Tavares led the team in scoring. General Manager Garth Snow brought in Rolston and veterans like Marty Reasoner and Evgeni Nabokov to bring it all together. Rolston, who played in New Jersey the last three years, came via trade, having been dealt for longtime Islander Trent Hunter. Rolston has played in nearly 1,200 NHL games and scored more than 700 points. Rolston doesn’t dismiss the Isles’ late-season run but he downplays its significance. Along with appearances in the 1994, 2002 and 2006 United States Olympic teams, the Flint, Mich., native has almost a full season’s worth of playoff experience, logging 31 points in 70 postseason games. Rolston was the leading playoff goal scorer for the 1996-97 Stanley Cup champion New Jersey Devils. He’s played key roles in the postseason for Boston and Minnesota as well. Rolston is pleased to be in this position. And fully healthy at that. He acknowledges that the right pieces are in place for the Isles to end a four-year playoff drought and, potentially, a span of 17 years in which they’ve failed to win a postseason series.